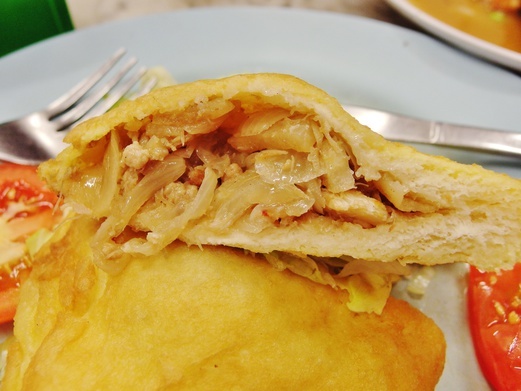 Yut Kee Restaurant has been serving up traditional Hainanese fare since 1928. 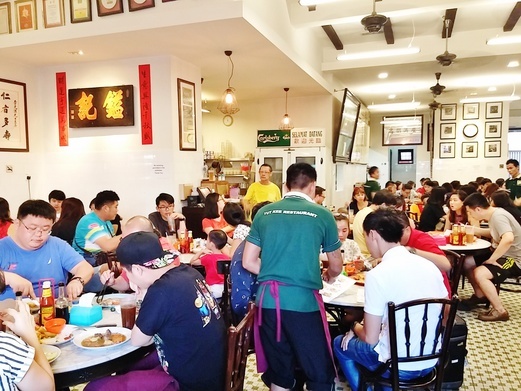 It is one of the oldest kopitiam names in KL and is also one of the most popular breakfast places to go to for both locals and tourists. 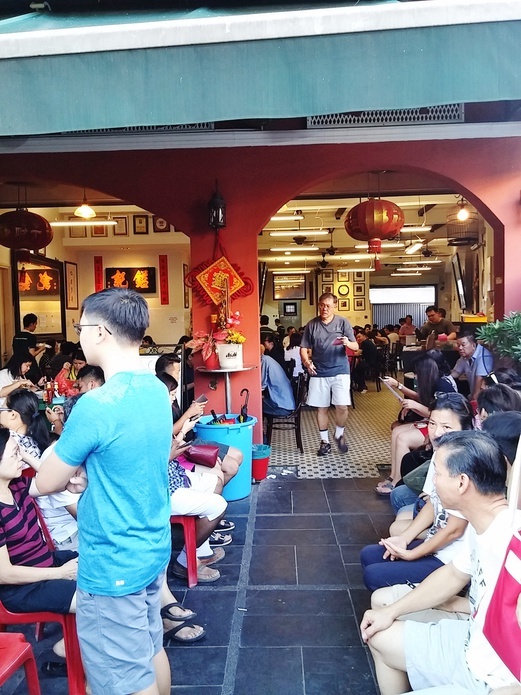 It was previously located along Jalan Dang Wangi (just a right-angled turn from its current premise) in a very old and run-down coffee shop space that had suffered decades of wear and tear. To get to Yut Kee Restaurant, you can take the LRT to Dang Wangi and then follow the above path. It’s about a 5-minute walk away. 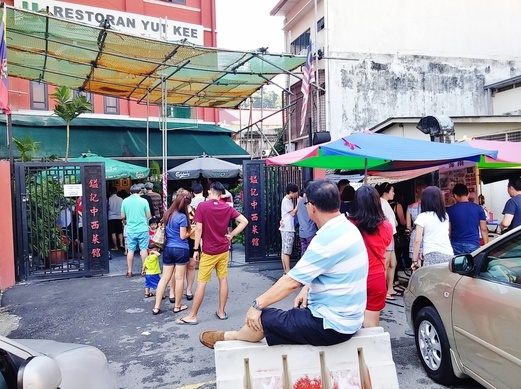 Once arrived at Yut Kee, you would most likely see (if you weren’t one of the first few customers) a queue of people either sitting down or standing up outside the restaurant. Do not join in the queue. Look for the uncle in the background holding a notepad and a pen and give him your name and the total number of persons dining in. These people hanging around outside were just waiting for their names to be called. We waited for at least 20 minutes before being ushered to a table. The moment we were seated, someone just automatically came to us to take order. By the way, if you’re here alone or in pairs, most likely you’d have to share a table with other people. 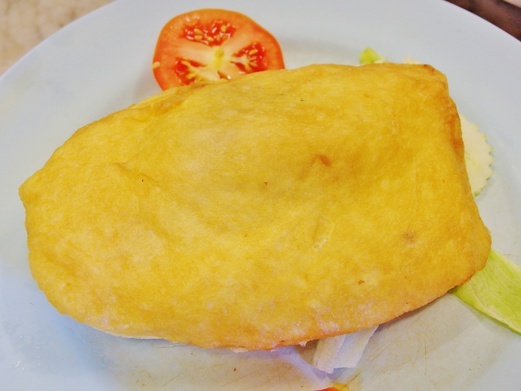 The humble Roti Babi (RM10) looked like a very ordinary sandwich with no frills. The bread was very soft and fluffy. It was able to absorb all those lovely flavours from the filling that was very well seasoned. There were shredded pork, ground pork, lup cheong (Chinese sausage) and onions in the filling. Overall, the taste really reminded me of luncheon meat. The lady boss came by our table and suggested that we eat the roti babi with some Worcestershire sauce. That was an excellent pairing because the Worcestershire sauce added sharpness and tanginess and hence was able to cut out any cloyingness or greasiness of the meat. 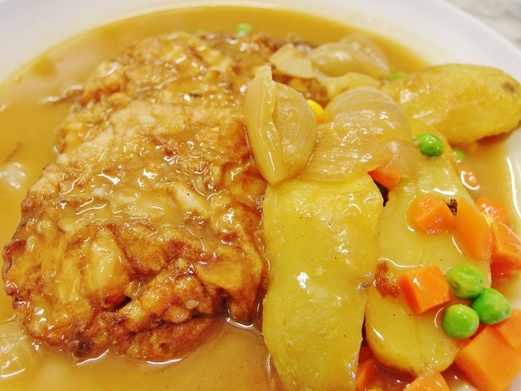 The Pork Chop (RM12.50) consisted of 2 pieces of egg battered pork with potatoes and mixed vegetables, drenched with a savoury brown sauce with onions. The sauce was absolutely delicious and not salty at all. It didn’t taste artificial too like those made with crappy seasoning powder such as the one from It Roo Cafe in JB. Although these pork chops weren’t coated with breadcrumbs and they didn’t have that kind of crunch like other fried pork chops, the batter that was redolent of egg was tasty and was even better when it soaked up all that awesome sauce. The meat was also tender and juicy. The potatoes were really good too, all soft and fluffy. 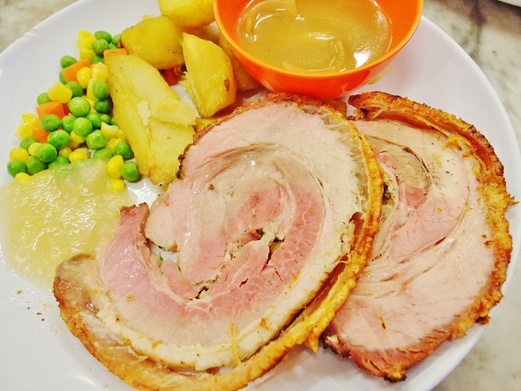 The Roast Pork Special (RM19.50) is only available on Fridays, Saturdays and Sundays. It was a real delight to see the freshly roasted rolls of pork coming out from the kitchen and the carving was done near where the counter was. The meat was very tender (just look at that pinkish middle!) but the hero of the dish had got to be the crispy crackling that gave a resounding crunch when bitten into. Most of the fat underneath the skin was already rendered off so overall this was quite lean and not greasy at all. There were apple sauce and the same brown sauce as the pork chop’s on the side – perfect marriage of sweet and savoury flavours. For drinks, we had Kopi Peng and Teh Peng (RM2.50 each), both of which were gau (‘thick’) and aromatic. Their coffee powder is selling for RM34 per kg for those interested to buy home. Another popular item we saw that was flying off the shelves was their Marble Cake (RM17 for whole cake). Many of the patrons would leave with boxes of the cake while some would just purposely come here to buy it. Marble cake fans, don’t miss this – it’s best to place a reservation for a cake upon ordering your food just to ensure availability. Once you’re done with your meal, proceed to the cashier to make payment. Prices are subject to 6% GST. 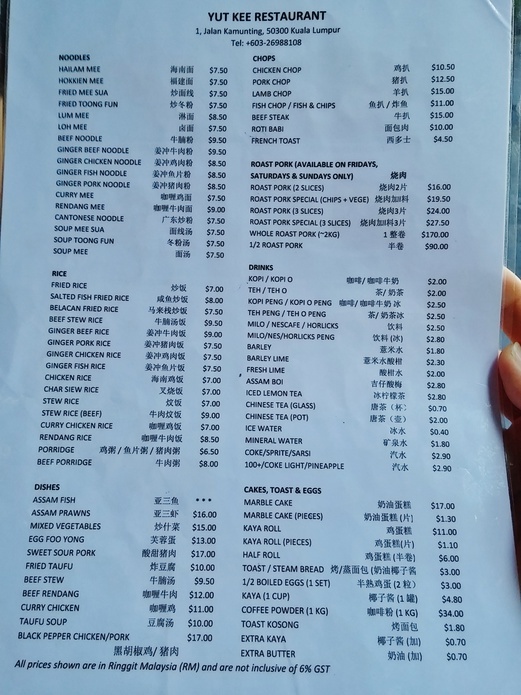 There is no service charge. When we left, we noticed that there was an independent stall selling Nyonya food just outside Yut Kee Restaurant on the right hand side. Business was quite brisk as it seemed to have a solid following of customers. 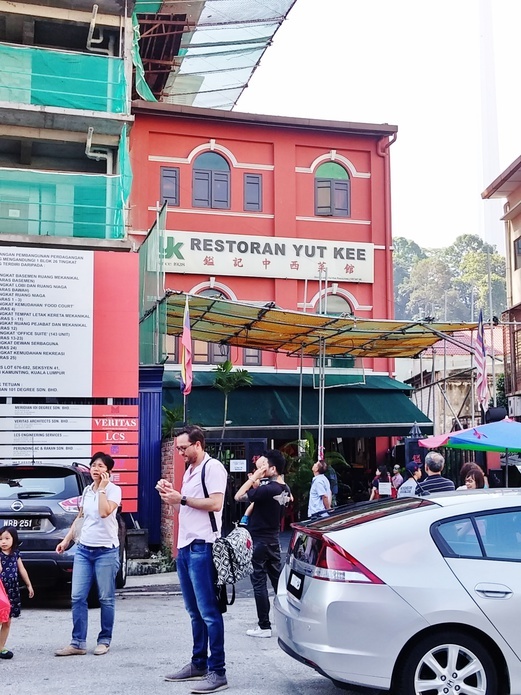 Shall check it out next time I’m back in KL ‘cos I know I will definitely come back to Yut Kee Restaurant again. In total, we spent about RM50 for two persons which I would say it’s quite expensive for a coffeeshop-style breakfast in local standards. 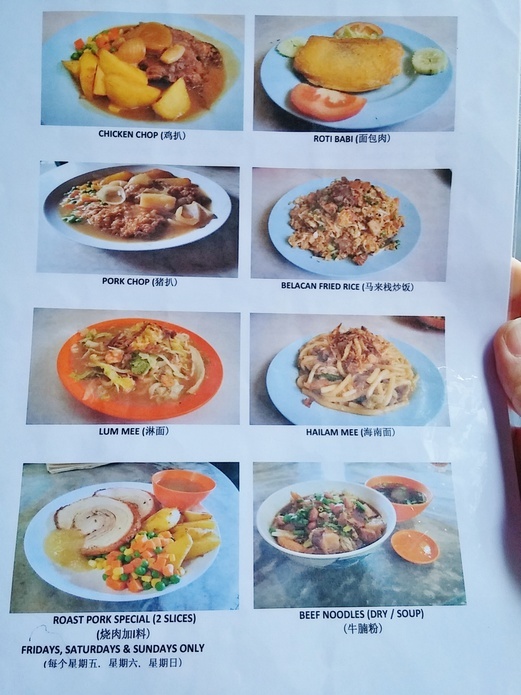 However, for the quality and taste of these dishes we have tried, the atmosphere of a traditional coffeeshop and an environment that’s clean and welcoming, I think the prices are considered reasonable. A must try when you’re in KL!